When asked how much daily prayer was necessary, [seventeenth-century French bishop and saint Francis de Sales] is reported to have counseled that a half hour is sufficient each day, except when one is too busy. In that case, pray twice as long, an hour. 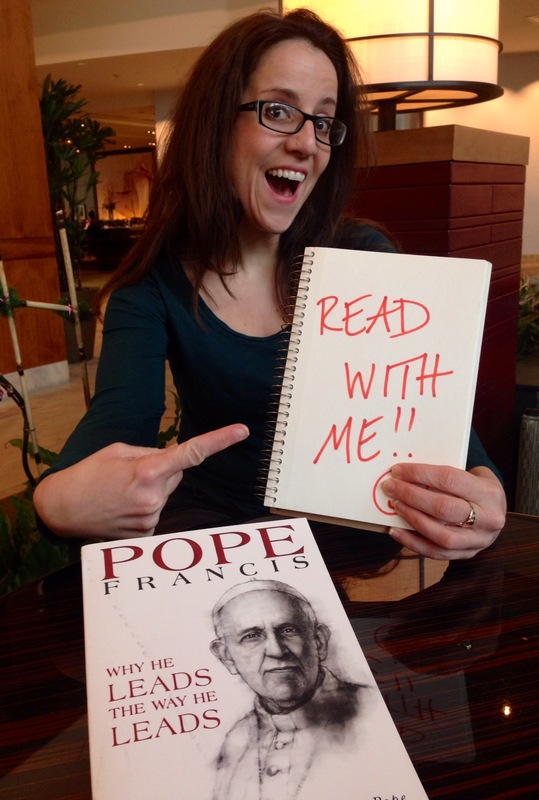 Who wouldn’t want be like Pope Francis? He’s inspiring people and spreading the Gospel without sacrificing any integrity. Pope Francis: Why He Leads the Way He Leads the latest from Chris Lowney, not only makes we readers want to lead like Francis, but it makes us believe it is possible for us to do so. With illustrative anecdotes about Francis and the Jesuit charism, Lowney takes us through the background and priorities that led Francis to today. There are no fancy seminars or secret tricks, no self-help books or items we need to buy that will help us lead like him (though Lowney’s book is a worthy investment). You just need one commodity: time. On Holy Thursday 2013, Francis advised his pastors that they should be living so closely with their flocks that they have “the smell of the sheep”. Lowney references a Jesuit maxim, Age quod agis (Do what you are doing): be present to the present time. Be with the people around you. Immerse yourself in the here-and-now. Not only does this improve the quality of one’s work, it gives one’s leadership the cachet that can only come with attentiveness to those one serves. Commit to know yourself deeply, including your frailties, and come to some peaceful acceptance of yourself and your calling to lead. This Ignatian objective is a recipe not just for strong leadership but a good life. Where on the journey toward this goal do you find yourself? 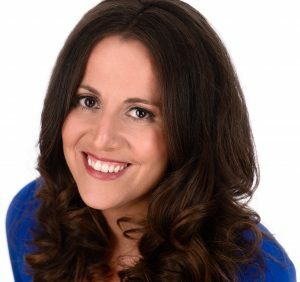 The self-awareness and inner calm that we all aim for aren’t achieved overnight: they take work, some of the hardest work a person will do in their life. It takes time. Jesuit formation is notoriously long, and this arduous process is part of what formed then-Fr. Bergoglio into the leader he is today. I keep coming back to the quote from Francis de Sales. When life is most challenging, we need to commit the most time to clearing our heads, examining our lives, and seeking God’s guidance. This is how we get to know ourselves in a way that allows us to grow in true leadership. It’s easy to look at Francis’ clerical life and imagine that he had it easy, living a lifestyle that prioritized prayer. But we all know clerics who don’t make those commitments, and we all know lay people who live busy lives in the world but who make time. In an effort to write a book that appealed to a wide audience, Lowney doesn’t write much about an aspect of time that I suspect is important to the Pope: eternity. Lessons from Jesuit formation and Francis’ life are accessible to people who don’t have the inclination to religious faith, and this book spells those lessons out clearly. 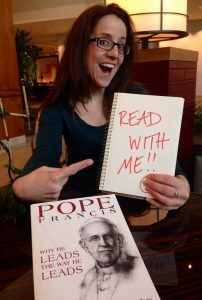 There will be plenty of writing done about the distinctly Christian spirituality of Francis that drives his leadership – and some of that, in his own words, will be published in just one month. Pope Francis: Why He Leads the Way He Leads clarified my thinking about how to be a moral, effective leader. The stories it compiles about Bergoglio the priest and Francis the pope are a delight. It is well worth finding the time to read. 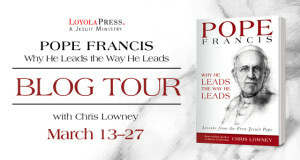 The blog tour continues tomorrow at The Catholic Book Blogger. Reading with me? Even if you haven’t finished the book yet, there’s still time! In two weeks I’ll be publishing your comments, links to posts, and other reflections from readers right here. You can leave a comment below or contact me to share your thoughts. I can’t wait to hear from you! Disclosure: This post contains affiliate links. Purchases made through these links put some change in my piggy bank at no additional cost to you.